Product Description: A professional quality latex sealer formulated with titanium dioxide and inert pigments. Intended Uses: A latex sealer for new drywall. Designed to provide exceptionally high hiding power combined with efficient sealing properties. Ideal for new construction where a two coat finish is required, and the finish coat is a low sheen product. Surface Preparation: Surfaces must be clean, dry & free from dust, grease, mildew & wax. Remove any loose & peeling paint and repair with patching compound. 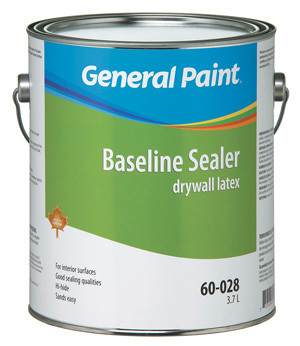 New Wood or Drywall: Seal bare surface with appropriate Latex, Hybrid or Alkyd primer for better uniformity. Previously Painted Areas: Glossy surfaces should be sanded to a dull finish or prime with an appropriate primer to provide good adhesion. Extra Features: *MPI #50 Approved. *Not recommended for use under higher sheen finishes.